Hey! Did you hear Amazon HQ2 is moving one of its headquarters to Northern Virginia? Cool. More importantly, did you check out the 14-page Comprehensive Housing Market Analysis published by HUD this summer and recently publicly released a few weeks ago? No? Why not? Don’t worry, it’s interesting. Short on time? No problem. Jobs are up. Visitors are down. Population is up. Sales Prices are up. Rentals are flat. Read the rest of article or comment below! The rate of job growth slowed relative to increases in recent years. However, mostly because of the job losses in the federal government, it is currently at a 0.8% increase Year over Year (YoY). The biggest winner: Information sector, biggest loser: Government. 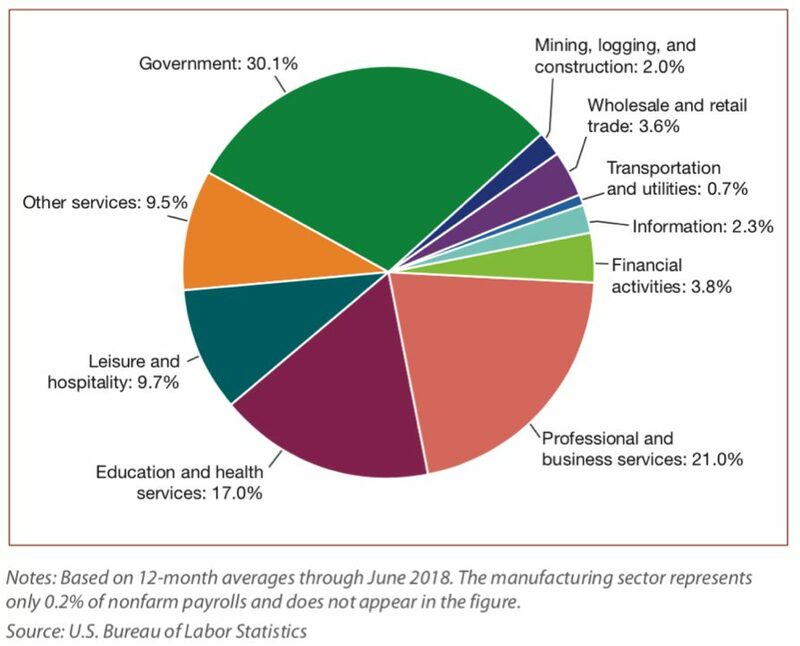 Still the largest payroll jobs come from Government followed not too far behind by Professional and Business Services. However, if you look at the gains since 2000, Leisure and Hospitality shows the greatest growth. The author has some interesting perspectives as to specific developments that can account for this increase, but I think if you have just lived in the area over the last 8 years it is evident on the number of restaurants, bars and new or updated hotels that have opened. Average wages in D.C. are among the highest, ranking 6th in the nation and forecasted job growth is 7,900 jobs or 1%. 30 million holiday visits were made to D.C., which is slightly down from the previous year, and according to Destination DC, there are approximately 31,673 hotel rooms, which means there are 11,560,645 stays available. As of July 1, D.C. has an estimated population of 703,300 (the largest D.C. has been was in 1950 at 802,200). On average the annual increase has been 12,300 since 2010, with some slowdown in recent years; however, in the 2000’s the average yearly increase was only 375. The median incomes for homeowners is $125,500 and $50,800 for renters, respectively 72% and 36% higher than the rest of the nation. The median housing sales price was $550,000 according to Bright MLS in 2017. 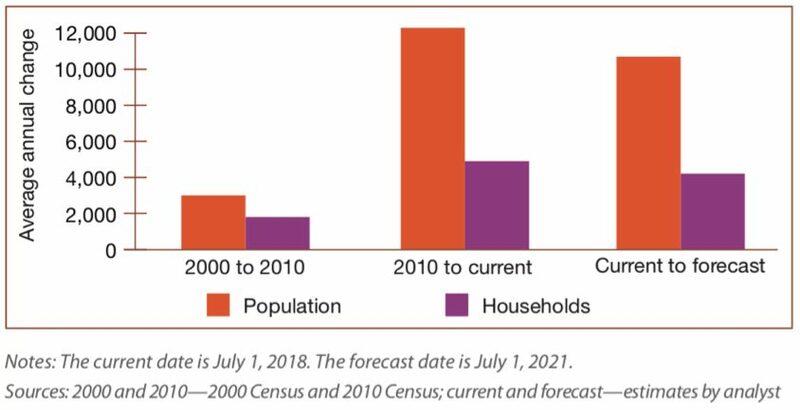 Condominiums are nearly half of all existing homes that have sold in D.C. Condo construction was highest between 2003 through 2006 with an average of 1,825 of units added yearly, but it has slowed to approximately 1,250 today. The forecast for the next 3 years is for 3,650 new housing sales in D.C. Rental housing is somewhat balanced with a vacancy rate at around 7.5%. Interestingly enough, the economic recommendation is no new additional apartment units will be needed over the next 3 years.